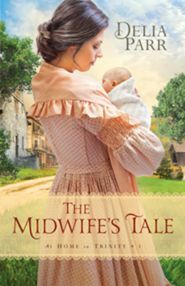 The Midwife’s Tale is Book One in the At Home in Trinity series by Delia Parr and the first of Ms. Parr’s books that I’ve had the pleasure of reading. It was a light and easy book to read. Ms. Parr demonstrates excellent storytelling ability as she weaves the tale of Martha Cade’s life as a midwife during 1830 in Trinity, Pennsylvania. At a time when modern medicine is gaining momentum, Martha finds herself in competition with the new doctor in town. Coming from decades of midwives before her, Martha has endured extensive apprenticeship and loads of deliveries. She’s witnessed the miracle of birth repeatedly and still stands in awe of it. She appreciates the privilege of being a part of helping a new baby into the world. While performing her duties as a midwife, Martha is called out to remote locations and when she finally is able to return home, she finds her only daughter is missing. The heartbroken Martha could easily become a recluse who hides from the local gossips but she chooses to remain an active part of the community. A widow, Martha’s occupation is her income as well as her calling. When a group of renegade orphan boys and their guardian, a Reverend from out of town, comes into Trinity, they aren’t received well. Scapegoats for the crimes invading Trinity, the boys are at the mercy of the town’s people. One particular boy catches Martha’s heart and she finds herself being the hands and feet to show God’s love. I really enjoyed The Midwife’s Tale and found the book to be a delightful escape into the past. I look forward to the second book in the series. I received this book from Bethany House publishers in exchange for my honest opinion which I’ve provided here.